The annual requirement of fuel for Pressurised Heavy Water Reactors (PHWRs) in the country for the year 2015-16, 2016-17 and 2017-18 is about 875, 985 and 1330 tons, respectively, of Natural Uranium as Uranium Oxide (UO2). In addition about 40 tons of Low Enriched Uranium (LEU) as UO2 for Tarapur Atomic Power Station Units 1&2 (TAPS 1&2) (Boiling Water Reactors) and about 150 tons of LEU as UO2 for Kudankulam Nuclear Power Project Units 1&2 (KKNPP 1&2) (Light Water Reactors) will be required in the next three years. Uranium and Thorium are the two major resources for nuclear energy. The Department of Atomic Energy (DAE) through its Constituent Unit i.e., Atomic Minerals Directorate for Exploration & Research (AMD) has carried out exploration activities which has resulted in establishing resources of Uranium and Thorium in the country. As of June, 2015, AMD has established 2,25,936t in-situ U3O8 (1,91,594t Uranium) reserves and 11.93 million tonnes of Monazite (Thorium bearing mineral) in the country which contains about 1.07 million tonnes of Thorium. addition, PHWRs of 700 MWe capacities are also being constructed to utilise the available natural UO2 resources. On account of physics characteristics of Thorium, it is however not possible to build a nuclear reactor using Thorium alone. It has to be converted to Uranium-233 in a reactor before it can be used as fuel. With this in view, a Three-Stage Nuclear Power Programme, based on a closed nuclear fuel cycle has been chalked out right at the inception of India’s nuclear power programme to use Thorium as a viable and sustainable option. The three stage nuclear power programme aims to multiply the domestically available fissile resource through the use of natural uranium in PHWRs, followed by use of Plutonium obtained from the spent fuel of PHWRs in Fast Breeder Reactors (FBRs). Large scale use of Thorium will subsequently follow making use of Uranium-233 that will be bred in FBRs, when adequate nuclear installed capacity in the country has been built. The third stage of Indian nuclear power programme contemplates making use of Uranium-233. Thorium based reactors have not yet been set up in the country for generation of power. A 30 kW (thermal) research reactor viz. Kalpakkam Mini Reactor (KAMINI), the only operating reactor in the world using Uranium-233 fuel has been set-up at Indira Gandhi Centre for Atomic Research (IGCAR), Kalpakkam (Tamil Nadu). 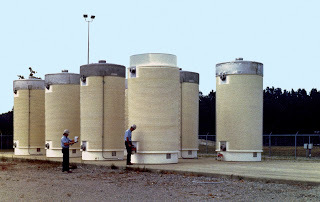 The Uranium-233 was obtained by irradiation of thorium fuel in CIRUS research reactor at Trombay and then reprocessing it. A 300 MWe Advanced Heavy Water Reactor (AHWR) using thorium based fuel has been designed and developed. This reactor will serve as a technology demonstrator for the thorium fuel cycle technologies. This information was given by the Union Minister of State (Independent Charge) Development of North-Eastern Region (DoNER), MoS PMO, Personnel, Public Grievances & Pensions, Atomic Energy and Space, Dr Jitendra Singh in reply to unstarred question in Rajya Sabha today. India has demonstrated the capability of launching 1.4 ton class of satellites using Polar Satellite Launch Vehicle (PSLV) and 2 ton class of satellites using Geosynchronous Satellite Launch Vehicle (GSLV) Mk II to Geosynchronous Transfer Orbit (GTO). Indian Space Research Organisation has taken up the development of a new generation launch vehicle named GSLV Mk III, with capability to launch up to 4 ton class of satellites to GTO. As a part of development, an experimental flight of GSLV Mk III with passive cryogenic stage was successfully launched on 18th December 2014 to validate the critical atmospheric regime of the flight. The endurance hot test of high thrust indigenous cryogenic engine of GSLV Mk III has been successfully conducted for duration of 800 seconds on 16th July, 2015. After the successful qualification of the integrated cryogenic engine and stage, the first developmental flight of GSLV Mk III is planned. ISRO and NASA are jointly working on the NASA-ISRO Synthetic Aperture Radar (NISAR) mission to codevelop and launch a dual frequency synthetic aperture radar satellite. • Design, Develop and launch a Dual frequency (L and S Band) Radar Imaging Satellite. • Explore newer application areas using L and S band microwave data, especially in natural resources mapping & monitoring; estimating agricultural biomass over full duration of crop cycle; assessing soil moisture; monitoring of floods and oil slicks; coastal erosion, coastline changes and variation of winds in coastal waters; assessment of mangroves; surface deformation studies due to seismic activities etc. Implementation Arrangement (IA), defining the roles and responsibilities of ISRO and NASA has been signed by the two agencies in September 2014. ISRO has completed the Baseline Design Reviews of Spacecraft and S-band SAR payload. JPL has successfully completed the Mission Concept and Key Decision Point reviews. The first Joint Steering Group (JSG) meeting of NISAR was held on July 21, 2015. NISAR satellite is expected to be launched during the year 2021. The cost of the project comprises of (i) cost of ISRO’s work share, which is estimated to be Rs 788.00 Cr and (ii) cost of JPL’s work share, which is expected to be around USD 808 millions. Development of Reusable Launch Vehicles is a technical challenge and it involves the development of many cutting edge technologies. The first test flight (HEX-01) of Reusable Launch Vehicle – Technology Demonstrator (RLV-TD) would demonstrate the hypersonic aerodynamics characteristics, Avionics system, Thermal protection system, Control system and Mission management. Based on the test flight results, further flights would be required to demonstrate reusability of the winged body. Reusable Launch Vehicles are aimed at cutting down the cost of satellite launches. However, the magnitude of cost reduction depends on the development and realization of fully reusable launch vehicle and its degree of reusability. At present, operational launch vehicles in India are expendable launch vehicles, which are designed to be used only once and their stages are not recovered for reuse. The launch vehicle typically consists of several rocket stages and the stages are jettisoned one by one during various phases of the mission as the launch vehicle gains desired altitude and speed. In a meeting of State Food Secretaries held here today procurement target for Kharif Marketing Season (KMS) 2015-16 has been finalised 300 lakh tonnes. The meeting chaired by the Union Food Secretary, MS Vrinda Sarup reviewed arrangements for procurement of paddy and coarsegrains in producing States, particularly in decentralised procurement States and other non-traditional States to maximize procurement of paddy/ rice and coarsegrains during KMS 2015-16. States have been asked to identify immediately areas with maximum paddy production and to open adequate purchase centers and deploy sufficient manpower. They have also been advised to make arrangements for publicizing MSP fixed, procurement centers opened through print and audio-visual media as well as through pamphlets in local languages. State Governments have also been asked to prepare details of storage plan for the ensuing KMS and have an action plan to meet the deficit in storage requirements, if required. Regarding Packaging material, Food Secretaries were requested to place indents for purchase of jute bags in time to avoid last minute shortage of packaging material. The States were also requested to furnish, on daily basis, the revenue district-wise procurement details of previous day for Online Procurement Monitoring System (OPMS). The FCI was directed to constitute joint teams with the State Governments to oversee the conduct of procurement operations and to attend specific complaints, problems etc. The Government of India has set up seven Zonal Cultural Centres (ZCCs) having their headquarters at Patiala, Udaipur, Allahabad, Kolkata, Dimapur, Nagpur and Thanjavur with the objectives to preserve, promote and disseminate the traditional folk and tribal arts and culture of all the States/ Union Territories. The ZCCs have been carrying out various activities and organizing programmes at the national, zonal and local levels in accordance with their aims and objectives, implemented through various schemes. The Government provides regular plan support for implementation of various schemes. The regular plan support earmarked for all ZCCs for implementation of their Action Plan in the current financial year 2015-2016 is ` 59.91 crores. The Government will continue to preserve and promote the folk and tribal arts and culture of all the States/ Union Territories by carrying out various activities and organizing programmes at national, zonal and local levels through ZCCs. This information was given by The Minister of State for Tourism (Independent Charge), Culture (Independent Charge) and Civil Aviation, Dr. Mahesh Sharma in reply to an unstarred question in the Rajya Sabha today. There are 3,686 centrally protected monuments/sites in the country under the jurisdiction of the Archaeological Survey of India. The Archaeological Survey of India is responsible for protection, conservation and maintenance of monuments, archaeological sites and remains in the country which have been declared as of National importance under the Ancient Monuments and Archaeological Sites and Remains Act, 1958. Besides this, development of environs in and around centrally protected monuments/sites, providing basic facilities/amenities (e.g. drinking water, toilet blocks, facilities for physically challenged, pathways, cultural notice boards/signage, vehicle parking, cloak rooms, etc.) to the tourists visiting centrally protected monuments are the other activities which the Archaeological Survey of India undertakes, as per need and resources. Further, improvement and up gradation of these public amenities is a continuous process. India with large agriculture base is rightly poised to meet the food needs of the world. Government of India is committed to the growth of the food processing sector. With increase in food processing India can become the food factory of the world. Mr Jamuda said that the government has given necessary importance and focus to the food processing industry and the ministry has launched various schemes for the promotion of food processing industry. With the processing of food, farmers will get assured market and better price for their produce, the food prices will not grow controlling the food inflation and unemployed youths could get jobs. Even without incentives food processing industry registered 8.4% growth rate and that shows the potential for growth of food processing sector in India. Speaking on the occasion, Mr Amitabh Kant, Secretary, Department of Industrial Policy & Promotion(DIPP), stressed on focussing more on processed food as India is one of the largest producer of Milk and second largest producer of Fruit and vegetables, but its exports were almost negligible. India should develop its traditional food items under global standardization and mechanization with least human touch. India should also develop its own brands and have its world class food labs and logistics for taking the finished products for shipping immediately . Dr. Ajit Kumar, Vice-Chancellor, NIFTEM told that India’s traditional sweet 'Ghevar' of North India along with Hyderabad’s famous Biryani has been chosen among 12 traditional dishes of different states that would be soon launched world wide to satiate global taste buds under the ‘Make in India’ flagship program of Government of India. The other dishes of India that have been selected to be launched globally include 'Gushtaba' of Kashmir; chicken curry of Punjab; 'khaakhra' and 'khandvi' of Gujarat; bamboo steam fish of south India; 'vada' of south India, 'khaja', 'inarsa', ‘sattu’’ and ‘Kabab’ of Bihar and Uttar Pradesh and 'Puran Poli' of Maharashtra. Dr Ajit Kumar informed that “Make in India” is a flagship program Prime Minister Narendra Modi designed to facilitate investment, foster innovation, enhance skill development, to protect intellectual property and to build best-in-class manufacturing infrastructure for products made in India. India is known for its traditional foods, which are mostly confined to the unorganized sector at present. Aiming at the uniform and hygienic mass production of those highly demanded traditional food products NIFTEM has launched a “Make In India” project for the standardization, mass production and marketing of traditional Indian Dishes all over the country as well as all over the world. Through this “Make In India” programme we may aim at making India the “Food factory of the world” & capture the whole world’s food market. National Institute of Food Technology Entrepreneurship and Management (NIFTEM), a Deemed–to-be university under De-novo category and Autonomous Institution under the Ministry of Food Processing Industries, Government of India has organised a two day Make In India conclave and Food HR Conclave on July 30 and 31, 2015 at Hall no 7 at Pragati Maidan as part of the 11th Food and Technology Expo 2015. The Union Minister of Health and Family Welfare, Shri J P Nadda stated that the Health Ministry is setting up an AIIMS in Jammu and Kashmir and will provide similar facilities of AIIMS in both Jammu and Kashmir regions. The Union Health Minister, Shri J P Nadda stated this after meeting a delegation from Jammu and Kashmir comprising State BJP President and Lok Sabha MP, Sh. Jugal Kishore Sharma, Deputy Chief Minister of the State, Sh. Nirmal Singh, State Health Minister, Sh. Lal Singh and State BJP General Secretary, Sh. Narendra Singh, who met the Union Health and Family Welfare Minister, here today. “The NDA government under the leadership of Prime Minister Sh. Narendra Modi ji is committed to provide healthcare facilities for all regions. And we are committed to balanced regional growth when it comes to healthcare facilities,” said Sh. Nadda. The valuation of land held by Public Sector Undertakings (PSUs) is done as per the provisions contained in the Companies Act, 2013 and relevant Accounting Standards and amendments issued thereunder from time to time. The same norms are being followed by the PSUs under the Department of Heavy Industry. PSUs are free to get their assets including land, assessed at current market value as per accounting standards while accessing bank finance on the basis of their net worth. This information was given by Minister of State in the Ministry of Heavy Industries and Public Enterprises, Shri G.M. Siddeshwara in a written reply in Rajya Sabha today.